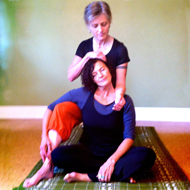 Thai Massage is an ancient bodywork practice which combines acupressure, energy meridian work and yoga-like stretching. It balances energy lines by working along their meridians in the body. 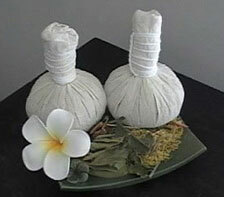 This is an Ayurvedic version of Shiatsu which encourages great relaxation and rejuvenation. You will continue to remain passive, while gently and fluidly, I do yoga-influenced stretches TO you. Yoga for lazy people! Or just people who wish to benefit from its many positive effects from stress-reduction to muscle spasm relief and the treatment of a wide variety of complaints using energy work. This work is also a conscious, meditational application of Metta (love and compassion) that will leave you with a life-affirming feeling of being well cared for. You will remain clothed (in comfy, stretchy clothes) and there will be no oil used. The massage will happen on a large, thick, sheet-covered mat on the floor. Your joints will be taken gently through their full range of motion, lubricating your them and bringing greater elasticity and flexibility to your muscles and tendons. You will feel your whole body loosen and relax and a delicious sense of calm and serenity. The deep presses of Thai massage squeeze the muscles and stretch the fascia (connective tissue). This helps to break down adhesions and stimulates the production of elastic fibres. I will be stretching your body in many directions, helping to bring balance and comfort back to your musculature and throughout your fascial system. I will ask you to participate in communication that will allow us to coordinate a perfect degree of stretch, and throughout the session I will maintain a vigilent, meditative sensitivity. You can feel safe and assured that you will never be pressed painfully beyond your edges. My school’s style, based on the traditions of Northern Thailand, combines elements of restorative yoga which emphasize comfort, relaxation and gentle stretching. Bolsters and/or pillows may be used to ensure comfort for particularly inflexible bodies. The idea is to take the muscles just beyond what their normal relaxed length would be. The muscles have a system by which they begin to sense this degree of stretch as the new state of relaxation. The joints will be lubricated when the movements stimulate the production of synovial fluid. You will enjoy the sensation of relaxed opening through your body. I completed Therapeutic Thai Massage Levels 3 and 4, Thai Foot Massage and Thai Herbal Hot Compress Course at Thai Massage Shivagakomarpaj (Old Medicine Hospital), in Chiang Mai, Thailand, 2016. This built upon my certification with 375 hours of training through Thai Massage Toronto (Levels I-IV) in 2010. Thai massage using steamed herbal compresses! Treat your muscles to the warming, healing balm of this ancient technique. The hot herbal bundles are applied to the clothed body and help release toxins, relieve muscle tension and joint pain and increase circulation in the body. The tantalizing aroma stimulates the senses to reduce mental fatigue and stress and clears the respiratory system. Those suffering from Fibromyalgia have reported great relief with this therapy. Clients will purchase a pair of the bundles for $15 and they can be used for up to 4 sessions if kept in the freezer.